We’re always looking for great people who want to learn and have a desire to make a significant impact. Send us your resume and if your skill set is relevant to what we need, we’ll get in touch! Our company culture is most important to us. We have a team of experienced senior-level people who genuinely enjoy what they do. We also have a team of younger people who are all very bright and bring a fresh perspective. Both teams work together to develop each other and the collaboration has proved extremely effective. We know that when our people grow personally and professionally, our company grows with them. Our clients see this and in return give us their trust, which is number one when it comes to the customer experience. Check Out Our Open Positions. We are Growing! 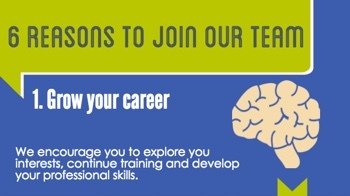 We encourage you to explore your interests, continue your training, and develop your professional skill set. Work for an industry-recognized brand and share in our success as a team. Our benefit and compensation packages are designed to attract and retain the best and brightest. As a WhiteLight Group employee, your hard work will be recognized and rewarded. Work on exciting projects that will ignite your passions and make a positive impact. We all take pride in and enjoy what we do at WhiteLight Group. Travel opportunities, company-wide events, team building. We know how to have fun while getting our work done. We welcome and encourage new ideas and out-of-the-box thinking. As a company that is constantly evolving, we’re never stuck in ancient ways.